When Alexander Cameron MacDonald passed away in 1917, local newspapers heralded him as Wangaratta’s first Postmaster. This was not true, as at least two other men acted in the capacity of Postmaster before MacDonald arrived in the infant town and he was never the designated Postmaster. A letter from Henry Darling Kemp, Melbourne’s Postmaster, to Governor LaTrobe in March 1850 noted that John Rogers had been recognised as the Postmaster from late 1847, and by late 1849 James Meldrum had stepped in to help out on account of the ill-health of Rogers, although he also was not officially recognised as the Postmaster. The Post Office was then allegedly situated in John Rogers’ Wangaratta Hotel (previously known as the Traveller’s Inn) on the north side of the Ovens River and MacDonald was noted as acting as a clerk to both Rogers and Meldrum. Kemp’s letter to LaTrobe was written in response to a letter sent by Alexander MacDonald in March 1850, applying for the position of Postmaster, and complaining about the impending removal of the Post Office from the north to the south side of the Ovens River. In his letter MacDonald noted that he had been in “the Post Office department” for nine months. This doesn’t fit with the later assumption that he was the Postmaster, and supports Kemp’s contention that he was a clerk in the Post Office. At 21 years old MacDonald would have been deemed too young for such an important position as Postmaster, and his objection to the decisions of the surveying and Post Office hierachy may have done him no favours. Kemp also mentioned in his letter that Rogers’ had indicated that he wished to resign as Postmaster due to his poor health and that there were three applicants for the position – James Meldrum, Alexander MacDonald and Mr [Edward James] Peacock. The opinion of Mr Green, the mail contractor, was sought to make the final decision. Not surprisingly, MacDonald was unsuccessful in his bid for the position of Postmaster, with Edward James Peacock being appointed. Despite the inconsistencies with how MacDonald was later portrayed, his personal recollections are a valuable insight into early Wangaratta. MacDonald was an educated man, a surveyor and geographer, and well-known for his study of the language and culture of the indigenous population. You can read more about him here. When MacDonald left Wangaratta, presumably in 1850 after his rejection by the Post Office, he moved to Geelong, then Ballarat and back to Geelong where he became an influential man, with many prominent men named amongst his friends. MacDonald, however, maintained contact with his friends in Wangaratta, Edgar and Maria Elvina Larkin who moved to the Ovens Crossing Place from Campbelltown in New South Wales between 1848 and 1849, possibly with MacDonald. The Larkin’s daughter Cordelia, who married Alfred Bould, also kept up the correspondence. In the early 1900s MacDonald was prompted to record some of his memories of early Wangaratta after reading a copy of the Wangaratta Chronicle sent to him by Mrs Bould. These reminiscences were used as the basis of his obituary, published in the Chronicle on the 23rd June 1917, and are partly reproduced here. In his memoirs MacDonald mentions that the north side of the Ovens was where most business activity was occurring. Assistant Surveyor Thomas Wedge’s 1849 survey map of the newly named town shows land reserved for government purposes on the south of the river, but does not indicate the exact intended location of the Post Office. No land was reserved for government purposes on the north side of the river, probably because of the tendency for flooding. The movement of any Post Office was usually followed by a concentration of business around this very important business so no doubt there were many interested parties wanting to have the Post Office near their own business or land holdings. The survey and subsequent removal of the Post Office to the south side of the river may have been the events that wrested business dominance from James Meldrum and John Rogers on the north of the river, and landed it squarely in the lap of my ancestor William Henry Clark. You can read more about Clark here, here and here, or use the search function of the blog. 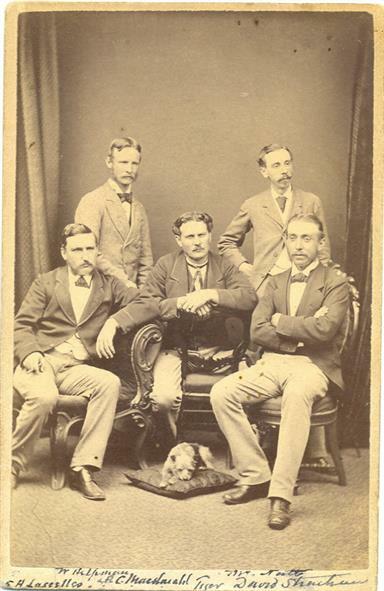 Alexander Cameron MacDonald, seated centre; unknown photographer, from the collection of the National Wool Museum, Geelong. Mr. A. C. Macdonald, J.P., F.R.C. I., F.RG.S., whose death and funeral were reported in “The Argus” this week, was a resident of Wangaratta in the forties. He passed through here in March, 1847, with a cousin in charge of horses, for the Port Phillip market, being his first of three overland trips from Campbelltown, N.S.W., and afterwards took up his residence, here for a few years, and was Wangaratta’s first post master… Mr. Macdonald was a close friend of Mr. and Mrs Edgar Larkin, grandparents of Mr. Ernest Bould, Wangaratta, their acquaintance dating back to the thirties at Campbell town, and which the late Mr. MacDonald cherished by corresponding regularly with Mr. Bould’s mother, who lives in Templeton street, up to within a few weeks of his death, last Monday. On acknowledging, the receipt of a copy of “The Chronicle” from Mrs Bould some time ago he stated,-“I have read the 30 years’ progress reports of Wangaratta. The early days as I know the place, were very interesting to me–the time when your father and mother lived in a cottage on the bank of the river due east from Clark’s Hotel. In 1847 the principal business of the district was carried on by Mr. James Meldrum, a publican, and Mr. Rogers, a general store-keeper; the post office was also in Roger’s store. These were the only two places of business on the northern side of the Ovens river at that period, and a Mr. Clark owned punt on the river, and also an hotel on the other side (now Wangaratta). In 1848 Mr. Meldrum built a brick hotel on Crown lands, a few hundred yards from the site of his old shanty, and the post office was housed in the new hotel in charge of the writer. At that period envelopes and stamps were unknown throughout Australia; correspondence was written upon a double sheet of paper folded and sealed with sealing wax. Rates of postage varied according to distance of transit. Ovens (Wangaratta) to Melbourne, 4d; Hobart to Ovens, 7d; the rate upon such letters was written with red ink, and such postage as a rule has to be paid by the person to whom the letter was addressed. Station owners and managers of runs on both sides of the Ovens had to travel in some cases 15 to 40 miles for theirs letters. … The removal of the post office from the north side of the Ovens river in 1849 was protested against by the dwellers on that side, and the writer in a letter inserted in the “Port Phillip Patriot'” also urged its retention there but to no purpose. 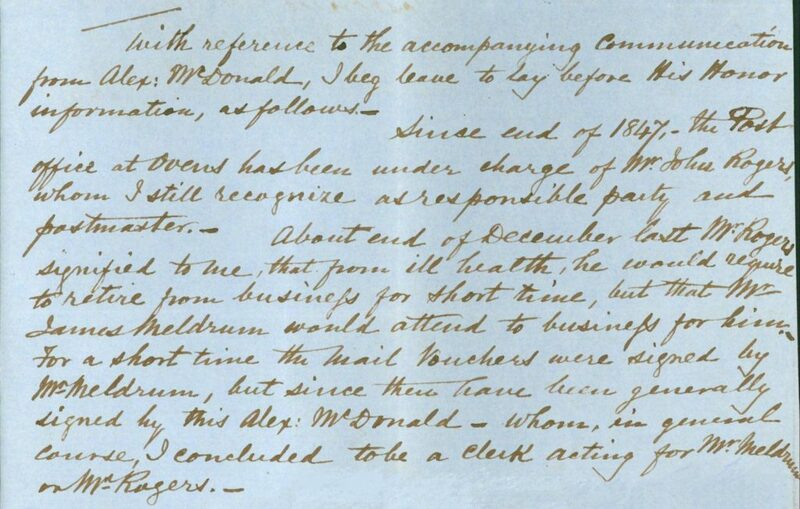 On completion of the survey of the township, land sales were held in Melbourne and the erection of private residences and places of business quickly followed.” There are still a few of the pioneer, residents of the district alive who were personally acquainted with Mr. MacDonald, and other later residents who knew him by repute, and so the above reference should prove of interest. Public Records Office of Victoria, Inward Correspondence Files of the Superintendent of the Port Phillip District, VPRS 19, Unit 133, file 521.